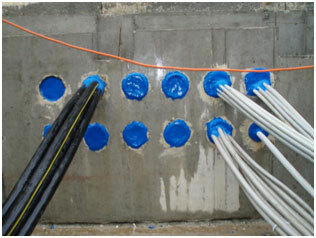 FIWA is a fire-resistant sealant based on a single component silicone compound. FIWA is also water-repellent. High bonding strength. UV and Ozone resistant. In the event of fire or temperatures in excess of 200 °C the sealant expands to about 10 times its original volume. During this process a porous mass is formed, which has excellent thermal insulation properties. In contrast to conventional materials that swell under severe heat exposure, the expansion of FIWA sealant is not caused by intumescent, but by chemical process (Intumescent means the occurrence of volume enlargement under the effect of heat, caused by the surface structure being inflated by fumes originating from the product). The advantage of this is that the expansion of FIWA is not accompanied by formation of large amounts of fumes. The porous mass that is formed has excellent thermal insulation properties. FIWA is absolutely halogen free and has a low smoke index, a high oxygen index and low flame spread characteristics. For applications where a high degree of (instantaneous) tightness is required. Dynamic sealing when a disaster occurs. Plugs are compressible and will return to their original shape after shock pressure. Easily withstands shock pressure loads of more than 150 psi (10 bar) easily. Ideal solution for the columns of offshore rigs, collision bulkheads and areas with explosion risk. The new DYNATITE system has been specifically designed for application where penetrations may be subjected to sudden extreme pressure loads. The system is also suitable for use in a wide range of environments where penetrations may be suddenly exposed to extreme conditions. These include for example partitions between hazardous and non-hazardous areas, blast walls, explosion-proof areas, and regions with elevated hurricane and tsunami risks. Based on the high/tech rubber grade and the engineered profiling, the DYNATITE plugs can be substantially compressed and get tighter with excessive pressure. RISE and CSD plugs are available in a special EMC design based on CONDUCTON technology, offering protection against electromagnetic impulses and interference. The system stands out by its flexibility and simplicity of use. Even the ducting of an extra cable is an extremely simple procedure. Please click here to view or download full BEESEAL technical & installation manual. 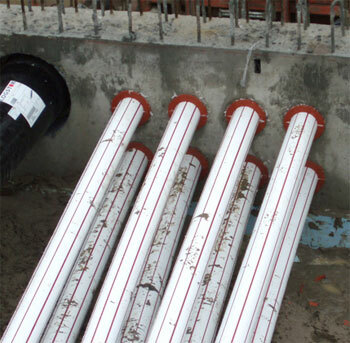 For the EMC protection of pipe and cable penetrations entering shielded areas, the electrically conductive sealant or flexible rubber CONDUCTON Sealant is available. Tests carried out in our laboratories have shown that the electrical resistance from pipe surface or cable braiding to mass is about 1-2 Ohm. Attenuation tests at DELTA Electronics Testing/Denmark have proven the outstanding damping properties of the EMC sealing system: 35-85 dB. Shielding microelectronic equipment from time-variable electromagnetic fields is of vital importance to prevent the induction of currents that can affect the performance of the equipment. Therefore, structural measures are taken in areas where major electronic systems have to be installed. Pipes entering the shielded area are capable of conducting electromagnetic pulses and fields. For the EMC protection of these cable penetrations BEELE Engineering has developed a special modification of the RISE system: RISE EMC. RISE-EMC combines EMC protection with fire resistance and gas and water tightness. The RISE EMC rubber, is kneadable and electrically non-conductive, used with CONDUCTON Sealant guarantees the effective damping of electromagnetic radiation. 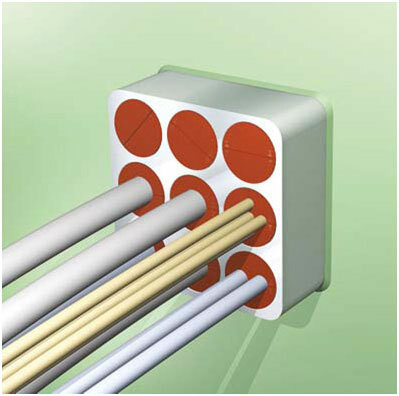 The damping values for cable transits are 35 - 85 dB. LEAXEAL is a sealing system for providing individual fire resistant as well as gas and water tight seals for cables and pipes. The high-pressure clamp seal with stainless steel compression plates is specifically suitable for the sealing of openings where considerable tolerances in the penetration opening and the cable/pipe have to be bridged. LEAXEAL is suitable for use in both existing and new installations.